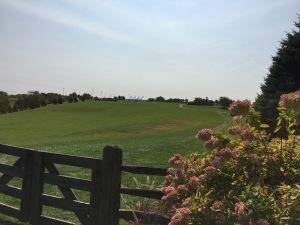 ​This is the second installment recounting my series of heart encounters on September 10 and 11, 2017 in connection with a pilgrimage I made to the site of the original Woodstock festival. 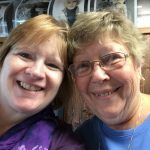 This post covers the evening of September 10, after my encounter with Sion at Big Pink in West Saugerties. Read Part 1 here. Sion had mentioned it was an hour and a half drive to Liberty. It hadn’t looked that far on Google Maps and even with the time it would take to find my way back down the mountain roads to the highway it seemed like an overestimation. But even after I’d found something like a main road it seemed to be taking a long time to reach the highway. The GPS was showing dozens of miles to go on the 2-lane rural road I was on. It was lovely and peaceful, and for the time being I was driving in daylight, albeit with the setting sun hitting my eyes at various turns so I kept driving blithely on. I skirted the north side of the Ashokan Reservoir then took a sharp left onto another 2-lane road through… wilderness. There was a house here and there but otherwise the unassuming road passed through an untouched valley. Meadows. Ponds. Outcrops. Everything looked pristine. Lovely. Enchanting. Wild. And still dozens more miles to go before the next crossroads. It made the rural roads leading to Big Pink seem practically metropolitan. 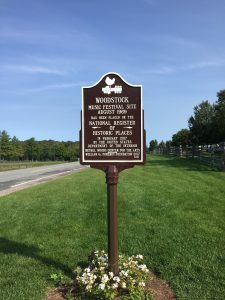 I had a series of heart encounters on September 10 and 11, 2017 in connection with a pilgrimage I made to the site of the original Woodstock festival. There’s so much to share that I’m breaking the narrative into 3 parts. Here’s the first. It’s long and I hope you find it worth the time it takes to read. Enjoy! The whole story starts, as all good stories do, with a giraffe. I’d become a fan of internet sensation April the Giraffe in February of this year. Watching her and her baby daddy Oliver on a webcam during April’s final months of pregnancy helped me get through the final months of a long-term contract job that I was unhappy about having to leave. When April gave birth on April 15 my gentleman friend and I were on a long weekend getaway, attending a relationship conference in Denver. The “she’s giving birth right now!” text I’d signed up for came around dawn and we huddled together in bed watching on my iPad as Tajiri came into the world. 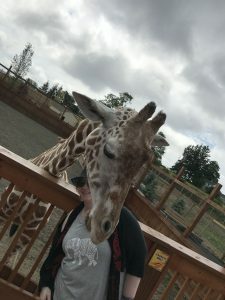 So it felt right to visit the new giraffe family on a future getaway. More April in an upcoming story. Accordingly, July found us spending a weekend in Binghamton, NY, the closest big town to April’s home, Animal Adventure Park. Details of that park visit aren’t directly relevant to this story although a few hearts were given. They’ll be recounted in a future post. The part that is relevant is that on the afternoon following our giraffe visit we were chilling in our hotel room, thinking about what else was nearby that we might visit before dinner. On a whim I asked how far away Bethel, NY was. 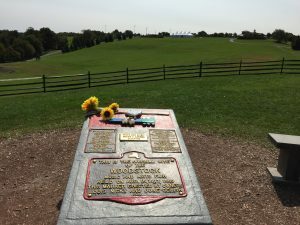 The original Woodstock festival was held there. I’ve long been fascinated by the event, even though I was only 8 years old when it happened. If we were within easy driving distance it would be a nice add-on to the trip. Here’s video from my most recent story, told on August 26, 2017 at The Auld Shebeen in Fairfax, VA as part of Better Said Than Done’s “Vacation and Other Disasters” show. Learn about the disastrous day trip to Monterey I incurred during a San Francisco vacation in October 1991. My narrative falls necessarily into the realm of creative non-fiction because 26 years later I remember only the basic sequence of events, not actual conversations or the finer details. My first draft, presented at rehearsal 2 weeks before the show, was basically a memory dump with a tentative framing device. The notes I got from my fellow storytellers helped me fill in some gaps and solidify the frame. In the interest of time and cohesiveness I had to compress some timelines, leave out some details and alter others. Along the way I gained some insights about why things played out the way they did all those years ago. I’m pleased with the final product and it got good feedback from the audience and my fellow storytellers. I’ll shut up now so you can watch the video. When you’re done and if you care to do so, read on below for a behind-the-scenes look at the actual events. 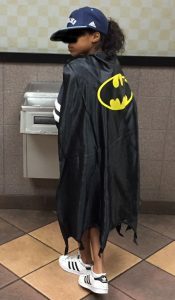 It never fails to amaze me how being open to the world around me brings a little joy and a connection to something as mundane as standing in a checkout line. At lunchtime I picked up a few things at Target. I made eye contact and smiled at the woman next to me at the check-out, which led her to remark on the weather, which led to her talking about her husband’s stuffy, soulless, windowless work environment at the Brentwood postal facility in DC. It seemed as if she needed to vent and I was glad to be there to listen. I reached into my purse for a heart to hand to her. It was a clear one, my favorite. 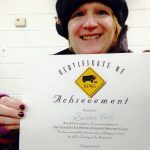 When I handed it to her she looked surprised, thanked me, and blurted out that she was a two-time breast cancer survivor and that “they just found another tumor” that would be coming out soon. Then she told me her name, Cathy, and I told her mine. I paid the cashier and took my bags and wished Cathy well. I didn’t think to say it at the time, but I hope the clear heart is a sign that she’ll soon be cancer free. Time of the entire conversation: Less than one minute. It was a first-world problem certainly but it led to encounters with 2 people whose backgrounds were different than mine but who I connected with seamlessly. Following on to the Zamboni story video, here’s video evidence of my cornering skills and Tom’s hanging-on skills. Also, here’s my prized Certificate of Achievement. I gave Tom a heart in exchange for it.